I talk about the Girl Scouting and handwork skills learned while growing up, the BA in Art and History with photography as my creative medium but until Lillian Vale gave me a 15 minute lesson on how to pull loops I was not confident to proclaim: I am an artist. 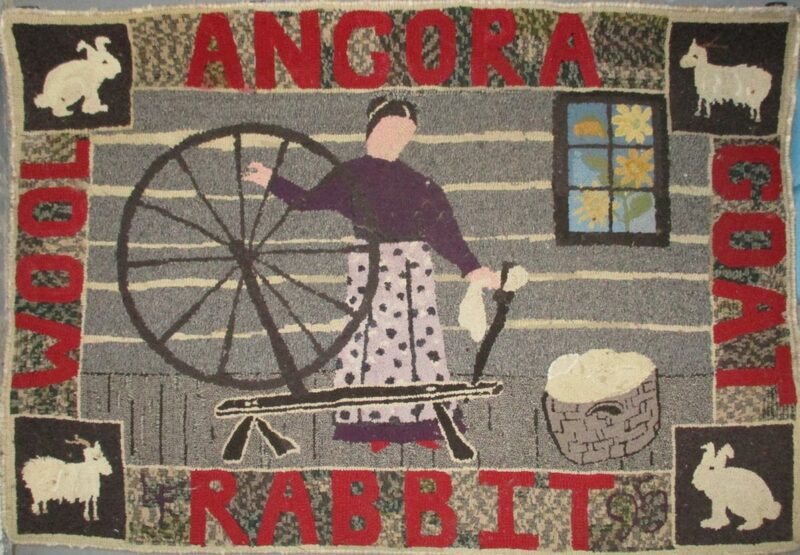 That session was on January 1, 1994, and rug hooking has lead to an amazing journey over 25 years. 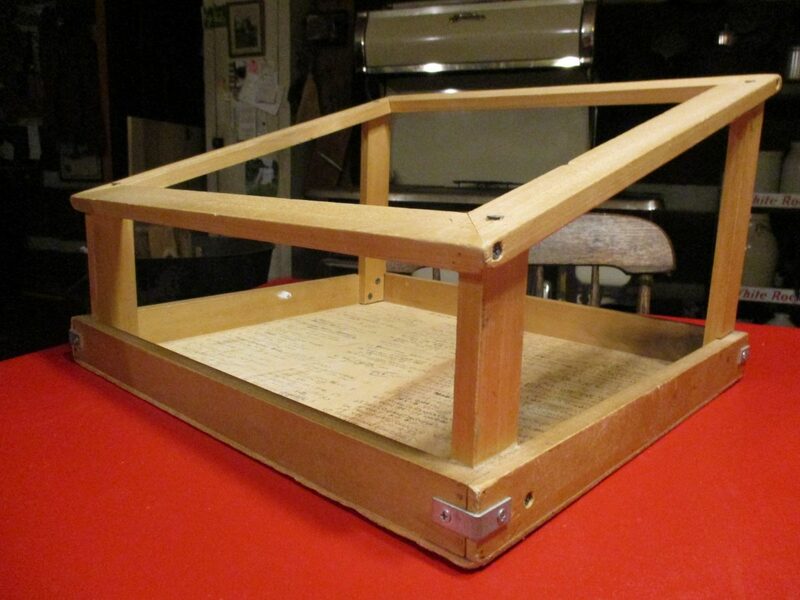 This frame supported hundreds of projects until 2008 when I upgraded to a floor model. I had to pin the backing taught, pulling the push pins out when I needed to move to another part. The first top wore out and Jim made a second one! I logged every project on the wooden base listing size, start, finish, title and if sold to whom. We do not have many places to store items, but the Pig rug is missing and 1994 was before digital photos. It was a large rounded pig line drawing (no “designer’s name). He was in the center of backing with no other details. However the second rug was my own design – the Spinner. A dream of what we would do when getting into our log cabin. The inspiration was Moravian Pottery mosaics. And rug hooking line drawings lead me to studying fraktur motifs, geometrics, nature and finally the confidence to “paint with wool” as an artist. Flash through the years, 200 rug patterns, dye recipes, a Design in a Box filled with fraktur templates all as Ruckman Mill Farm are now distributed by Green Mountain Hooked Rugs. 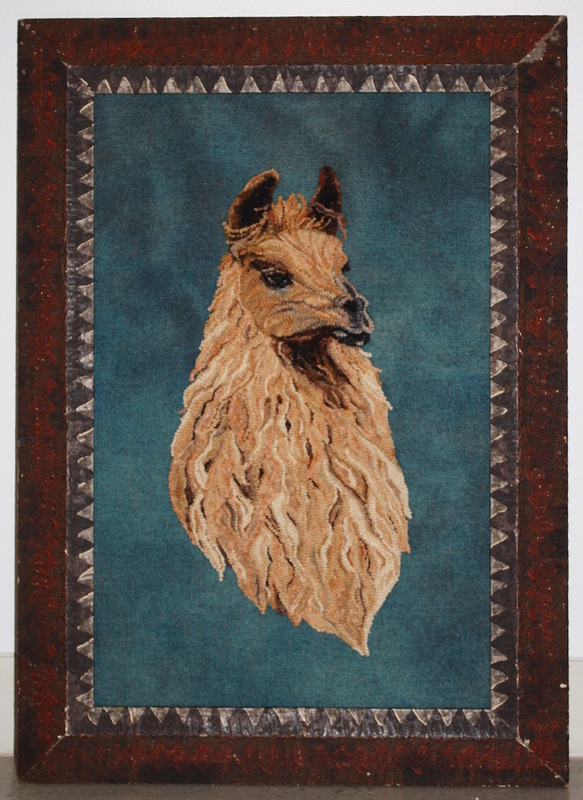 I served on boards of national and international rug hooking organizations, vended throughout the US and Canada, wrote a book about Design, sold hundreds of rugs, and exhibited in fine art collections. 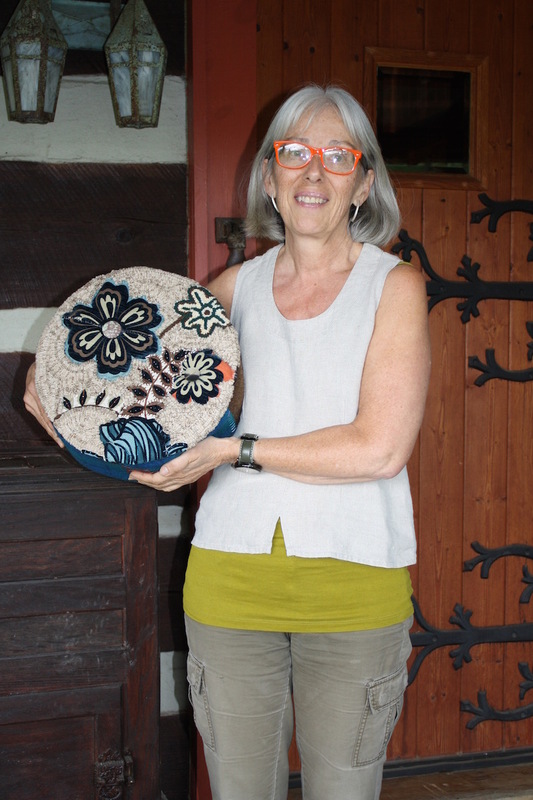 For the past five years, under a new company ArtWools, I have taught design to fiber artists, advocated for the arts in WV and work in my studio. The best of this journey is my confidence to say I AM AN ARTIST and the many friends I have met along the way. Looking forward to the next years creating. 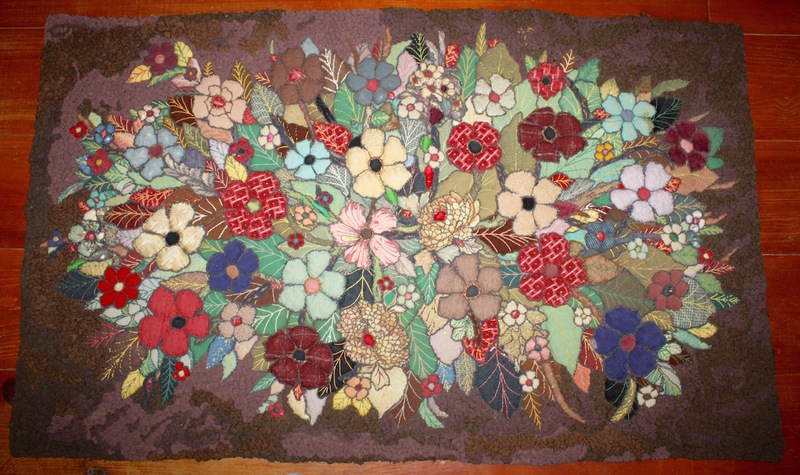 This entry was posted in elements and design in art, Fiber Musings, hooked rugs, textile art, West Virginia Artists and tagged fiber artists, fine craft, Green Mountain Hooked Rugs, hooked rugs, Ruckman Mill Farm, Rug Hooking Magazine, Susan L. Feller, west virginia on February 5, 2019 by Susan L. Feller. It has been 5 years since I began the Year Study. My goals were to explore, evaluate and exhibit the results of daily sketching and creating. I did EXPLORE with materials, techniques and composition lessons resulting in a renewed interest in hand stitching, experimenting with brushes and paints, and seeing more simply. EVALUATING my use of time is an important element as an artist. How to continue networking in one circle while expanding into others; keeping an ear open and helping in different ways needs to be communicated by actions and in conversations. Scheduling studio time and developing themes for the upcoming exhibits rather than creating inventory has been a process. One that with the distractions of nature here in West Virginia is more enjoyable than a commercial speed on the East Coast as I age. Transferring the Ruckman Mill Farm patterns and products to a new generation at Green Mountains Hooked Rugs opened my schedule to more studio time. Now teaching is focused on design and encouragement, others provide the materials. 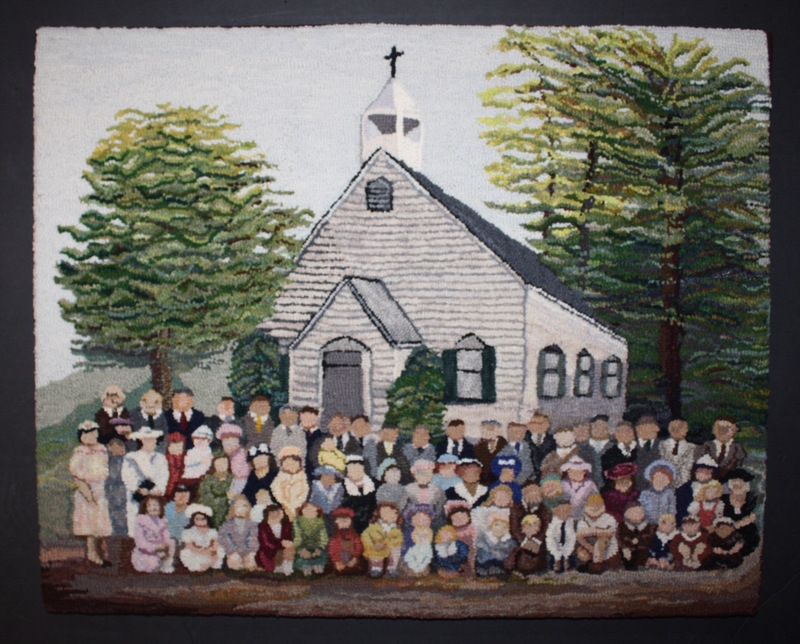 The EXHIBIT goal was met at Sauder Village Rug Hooking Week in 2015 when all twelve months and a collection of work were featured. Juried into and invited to show in several fine art exhibits validated the direction and I respect my peers recognition. My resume’ lists these venues with the ultimate, an Award of Excellence and purchase by the State Museum from the 20th Bi-Ennial Juried Exhibition in 2017 for Progress in the Mountains. The opportunity to curate the collection Glimpses Inside Appalachia this fall, shown at Raleigh Playhouse, Beckley, WV brought my work before a new audience and opened other exhibit venues. My five year goal includes developing the themes I identified from the study and exhibiting each in different markets. A new decade will be on the horizon by then and more goals. Speaking out about current events , Nature’s Beauty and Human Impact, and a Travel Series where I am developing each sketch several times. Hope to meet you on our journey. Happy creating. This entry was posted in current events, Fiber Musings, hooked rug workshop, juried art exhibit, textile art, West Virginia Artists, Year Study and tagged fiber artists, Green Mountain Hooked Rugs, hooked rugs exhibit, Ruckman Mill Farm, Susan L. Feller, West Virginia Culture and History on December 6, 2018 by Susan L. Feller. There’s a better way to explore West Virginia’s mountainous beauty and hear about the people living in Appalachia than you have been presented with recently. We are telling our story with art exhibits, serial podcasts and several books. 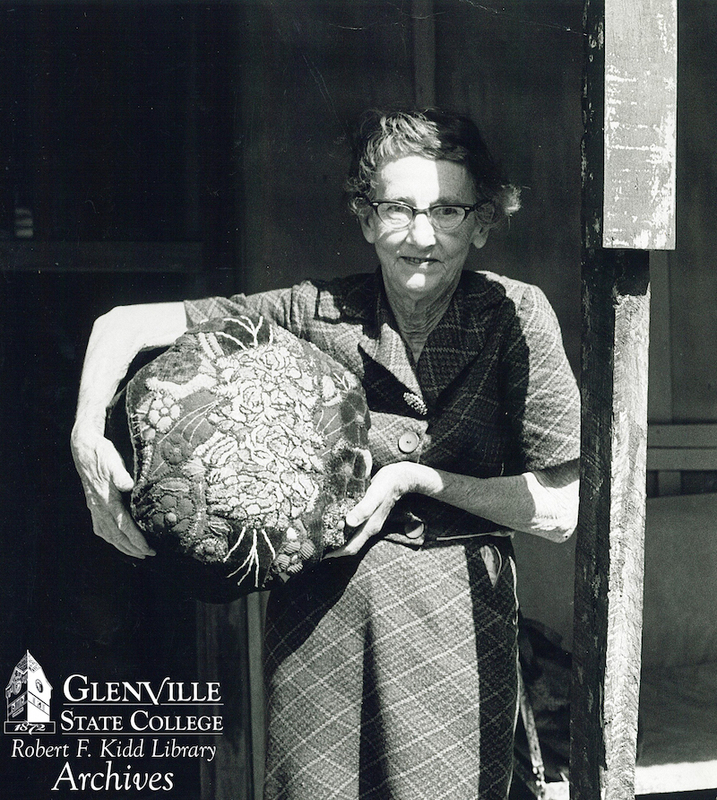 Fine art and Spoken word collections coordinated by Women of Appalachia Project have opened in Morgantown, WV. (Check the WOAP blue link for schedule of other venues). Two of the artists I met told me a bit of their stories. Nancy L Abrams documents life through photographs. Her journalism career lead to The Climb from Salt Lick, a memoir of Appalachia, published this past spring by WVU Press. Cheryl Ryan Harshman works in clay monoprints, fabric collage, and is an author. An award winning artist she is listed in Tamarack Foundation’s Creative Network. . Our discussion included the process of making clay prints, a medium with wonderful unexpected results. Marc Harshman is West Virginia’s poet laureate and married to Cheryl. I have heard his voice on WVPublic Radio reading work and now enjoyed his warm smile and artistic interests in person. I have promoted the podcast series Inside Appalachia to studio artists in Alaska and Maine because the interviews by host Jessica Lilly bring the neighbors right into your home. On October 20 there will be a live taping of Inside Appalachia at the Raleigh Playhouse and Tavern, Beckley, WV. Two videos featuring broom maker James Shaffer and millman Larry Mustain will be shown and the gentlemen interviewed. I was invited to open an exhibit at the Raleigh through November 12, I have themed “Glimpses Inside Appalachia“. Two dozen of my pieces ranging from views around our home to environmental and social issues will be hung. Looking forward to meeting Jessica and the team and talking about art. WVPublic Broadcasting has a lineup of podcasts from decades of Mountain Stage to the new Us and Them. Check them out and subscribe. The Mountain Artisans Quilting Book, Alfred Allan Lewis is out of print but worth searching for the stories of how a cooperative of marketing women and traditional sewers created contemporary fashion. The soothing voice of All Things Considered’s, Noah Adams traces the New River from its origins to joining with the Gauley as the Kanawha River heading to Ohio in Far Appalachia. Legends and locals fill the pages as he travels slowly along and often on the river. I expect you will think of the people and places of West Virginia, and Appalachia with a deeper appreciation after listening and reading. Remember we are “Almost Heaven”. 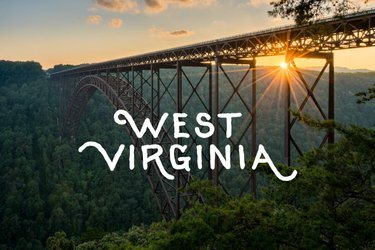 Check out WVTourism. 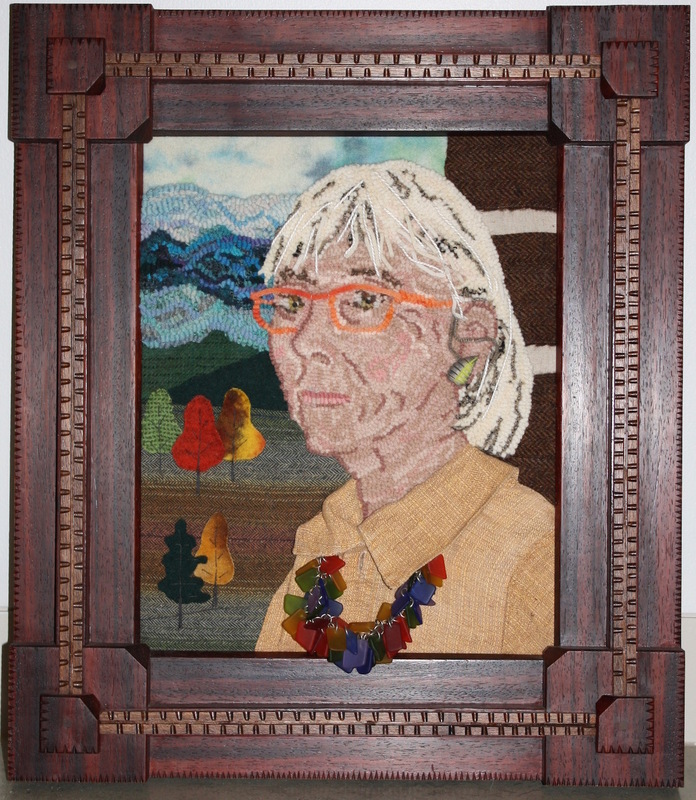 This entry was posted in current events, elements and design in art, Fiber Musings, textile art, West Virginia Artists and tagged 100 Days in Appalachia, fiber artists, Inside Appalachia, Susan Feller, Susan L. Feller, Tamarack Foundation, west virginia, WVPub on October 8, 2018 by Susan L. Feller. Seeing the long, green, 36″ round gasline pipes stacked on trucks slowly climbing the mountains of our state on a daily basis has raised my tension level. When I feel unable to control or change an event or action I create. Slowly a design nudges my consciousness. The visual concept begins to evolve on paper. With a few adjustments the story I want to tell appears as a cartoon (line drawing). My energy changes from lethargic to accelerated and materials are gathered, or made in the dye pots. Pulling loops and stitching with needle and thread, slowly I talk to myself. When finished I can talk to you. The natural gas-lines, proposed and begun, crisscross West Virginia as they travel East. There are stockpiles in what were hay fields, in abandoned parking lots, even in newly excavated spaces along highways and back roads. They are not hidden from view. The workers migrate from job to job across state lines and take up the hotel rooms built for tourism and business travelers supporting our long term economy. It is summer and the rhythms of farming continue too. Large round hay rolls cast their shadows in early morning and late afternoon light. Yellow dried grasses are rolled up revealing the fresh new greens of regrowth. This is a sustaining cycle humans developed which truthfully also is destructive and abusive of the soils and land. But that is another visual story. Today I look at haying season as nostalgic which is calming. My intent in using traditional rug hooking as a medium is to honor the utilitarian purpose of past generations and present my work to a new audience when shown on the wall as visual art. The two pieces were designed as large floor rugs for these reasons and because big gets attention. Simplifying the landscape images into shapes let me convey the repeating patterns and tension I felt. Circles of the pipe ends viewed by following those trucks and driving past the stockpiles and the innocent hayrolls lined up in rows are surrounded by dark and light depict the feelings I have driving past each subject. The companion piece is Lines: logging, haying and pipes. Using the same wool fabrics as in the Circles piece, with additional pieces for value changes, the logging industry is added to our state’s human impact on nature. The two partners – Circles: pipes and hay rolls and Lines: logging, haying and pipes were completed in 2018. Ready for exhibit. 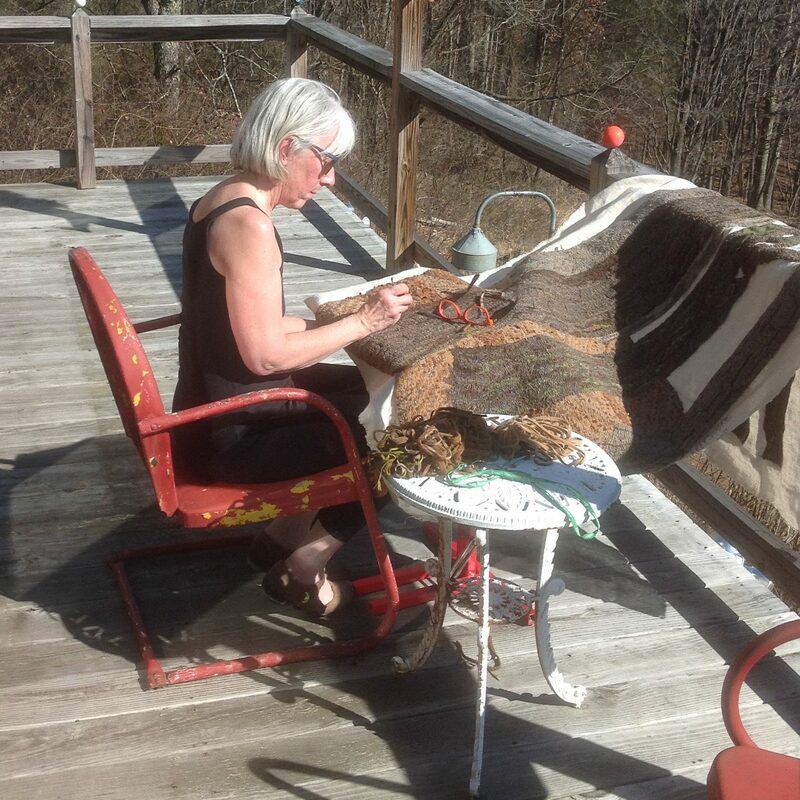 This entry was posted in farm life, Fiber Musings, hooked rugs, textile art, travel, West Virginia Artists and tagged farm life, fiber artists, hooked rugs, Natural gas pipelines, Susan Feller, Susan L. Feller, west virginia on July 14, 2018 by Susan L. Feller. 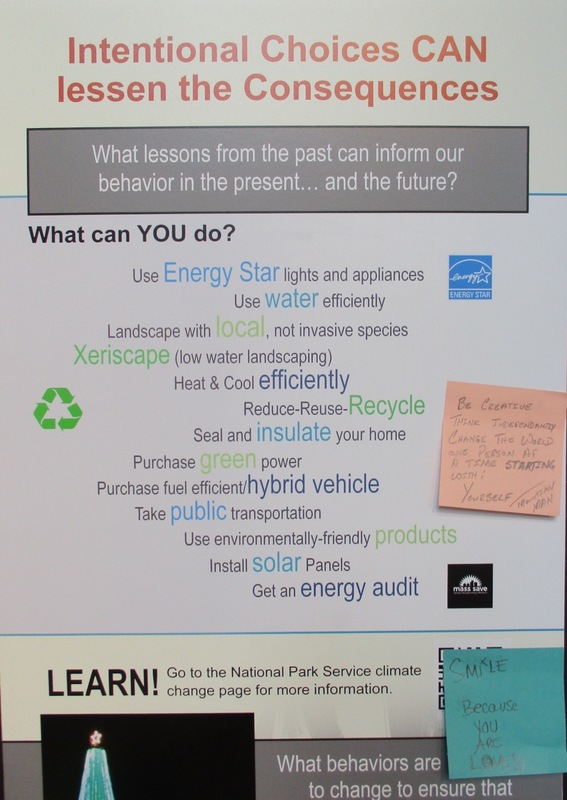 The signage at the Visitors Center included a display about Climate Change. I only had a morning to spend in the city but look forward to returning with some textile friends to share the emotional experiences I had, discuss the many topics of mutual interest, and support this community. On the road again heading north, with NO more major cities there was minimal traffic. Montpelier is my home for the upcoming week. The state capital for Vermont, with two major streets : State and Main. You can definitely “park your car” and walk around visiting shops, eating farm to table, Vietnamese, Thai, Chinese, Italian, Skinny Pancakes, at the New England Culinary School, pizza, gelato, 802 Coffee, or steak at the Capitol Plaza Hotel. I am here for the Green Mountain Rug Hooking School (in its 37th year). There are two four day sessions lead by instructors from the US and Canada. Check out this year’s schedule and consider attending in 2019. The listing of classes will be online after this session ends. My students in Contemporary Celtic Design explored the making of their patterns to be able to colorplan the knots, twists and turns. It is challenging and rewarding to see the lines become shapes. The next post will drop in on more classes and aspects of the school. 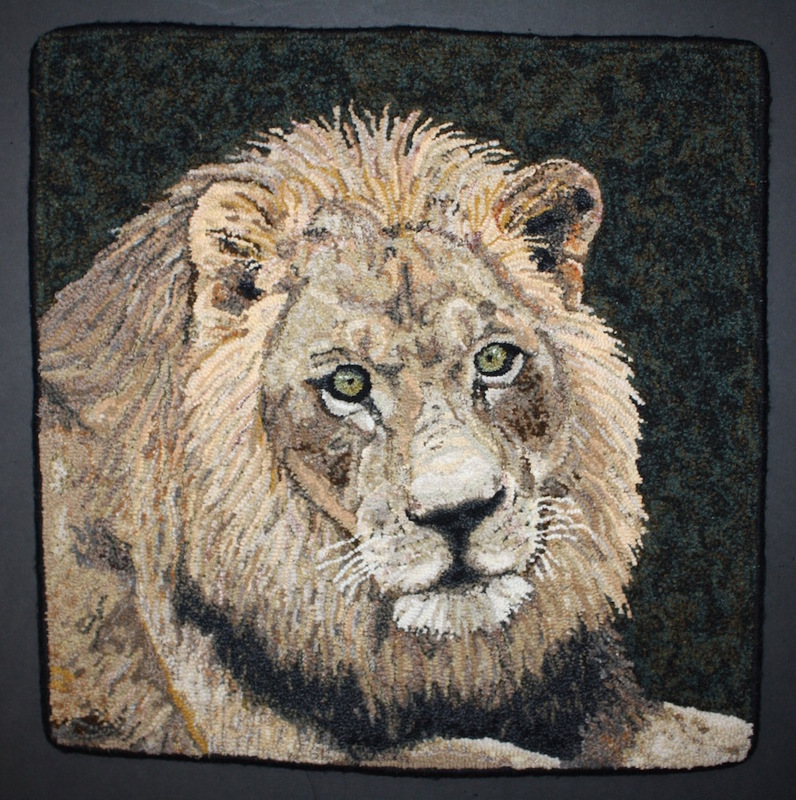 This entry was posted in elements and design in art, Fiber Musings, hooked rug workshop, travel and tagged Green Mountain Hooked Rugs, rug hooking, Susan L. Feller on June 19, 2018 by Susan L. Feller. Started the day off feeding the chickens in my work boots and forgot to change into traveling shoes until Jim called out…”Do you want your sandals?” I do drive better in the sandals. The Bobs and Jim will watch the grass grow on the farm as I travel to explore teach and network with fellow fiber enthusiasts. Day 1 up and off by 6:00 am heading for Lowell, MA to explore the Historical National Park of Textile Mills and the New England Quilt Museum. A nine hour trip according to GPS. But with wind damage reported in Wilkes-Barre, PA I decided to go east into NJ on I78 until there was a back up around Allentown, PA where I took Rt22 on into NJ and finally I80 to 287N over the Newburgh bridge crossing the Hudson and into CT. There is a lot of money being spent on roadwork through the cities of Danbury and Hartford. AND lots of traffic. No rerouting via GPS so in the end 9 hours became 13. Booked a room at UMass Lowell Inn and Conference Center from an online search of hotels in the area. I am a graduate of UMass Boston so felt an allegiance to the site. Perfect location for my reason to visit. My room overlooks the Pawtucket canal at the waterfalls. Recommend a textile conference at the Inn …. maybe a future ATHA bi-ennial even? 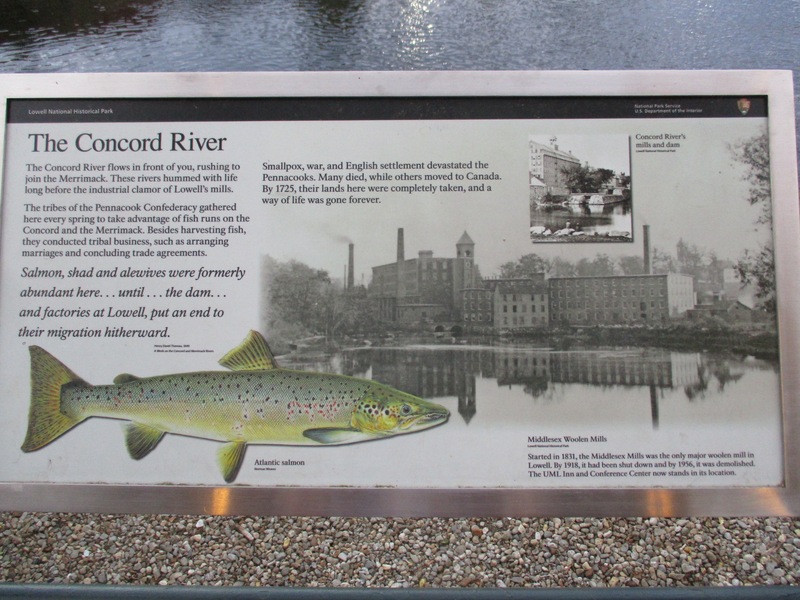 Great for touring the park, mills, and history besides location outside of Boston. Walked around some as the sun was setting, plan to get up early and explore. Day 2 report on the two museums. The Middlesex Mills was the largest woolen mill in Lowell, built in 1831, shutdown one hundred years ago in 1918 and demolished in 1956, the UMass Inn is built on the original site. Another brick building. This time with more than females working and living inside. I wrote a paper in college about the young women recruited to work in the mills and the work laws that evolved from their long hours, low wages, and living away from home. The park experience is something multi-generations should experience together. Take the canal boat, visit the mill, dormitory housing, and visitors center and try to put yourself in the shoes of those workers. This entry was posted in elements and design in art, farm life, Fiber Musings, textile art, travel and tagged fiber artists, Lowell Mass, Susan L. Feller on June 14, 2018 by Susan L. Feller. Time to work large, the subject warrants attention and big draws people to look. I cut off a piece of linen 60″ x 80″ which leaves a maximum finished size of 54″ x 74″ or two runners 26″ x 74″ (after excess to put on the frame). The size choice will be the first of many design decisions. The innocent circle shape can be seen along our country roads during haying season as farmers make huge rolls to feed their animals in the winter. The wide open fields are green then turn tan as the grass dries. Rolled, the new grasses grow back and the cycle continues year after year with care from the caretaker of the land-the farmer. I have been inspired by this cycle since youth when the shape was a smaller rectangle but the colors and care the same. Now there are different objects along many through ways stacked by the thousands waiting to go underground after the trees have been felled, stripped, and piled ready to be sorted for their end use-barbecue brickettes, lumber, paper pulp, firewood. Or they will be connected under the fields scarred by digging, or under the hundreds of waterways that are home to golden trout, endangered hellbenders and many other species besides our nourishment. This manmade project will transport gas extracted from the land more aggressively than in the past. The pipelines going through West Virginia and many other states are not benefiting the residents. The corporations intimidate our legislature to hold off taxing them so we will be left with roads to repair, lost income to tourism and natural guides yet a wound across our mountains. I have depicted the straight lines for power in Progress into the Mountains. Now comes specifically the pipes and resulting lines. Coloring comes next, what do I want the viewer to see? Green rings with dark rust centers, tan circles and green background. Will I use the rows alternating the subject? Or twelve inch squares of each pieced like a traditional quilt pattern? There is a smaller design coming along too using the green plastic straws I save, mixed media is still my favorite studio time. Do you see shapes, lines or colors daily that could become your visual statement on life? 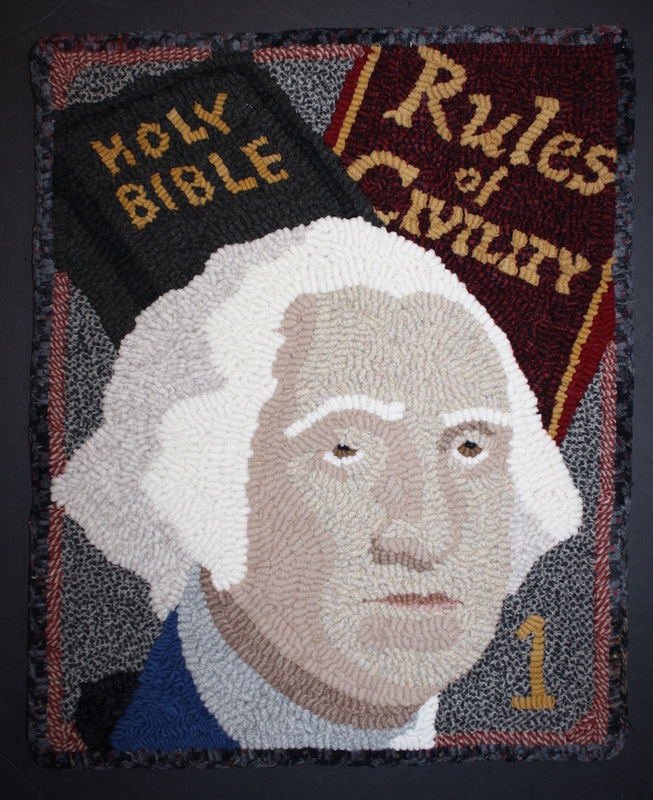 This entry was posted in current events, elements and design in art, farm life, Fiber Musings, hooked rugs, textile art and tagged fiber artists, fine craft, hooked rugs, pipelines, Susan Feller, Susan L. Feller, west virginia, WV Tourism on April 16, 2018 by Susan L. Feller. What a privilege I have been offered to study and mount one of the McDonald Sister’s rugs. Linking up, through a referral from the State Museum archivist, with the owner of two pieces has lead to hearing stories of the original purchase in the late 1960’s directly from the sisters, the “home life” of these textiles in their family rooms for years and for the past two decades tucked away in guest bedrooms in their summer cottage always on the floor. Come to find out the family had relatives who knew these ladies and even photos with mutual people. All of this adds more bits to the articles and stories I have gathered in researching how the handwork was done, by whom and why techniques were used now almost fifty years after the makers have passed on. New questions arise by looking at the back of this rug. There is an intricate pattern of stitches outlining the motifs. That makes sense, the layers are all attached, stuffed flowers, leaves and stems embroidered with details BUT the threads on the front are colorful and those showing on the back consistently dark? And why are there tiny light blue x’s in thread detailing many large petaled flowers? Those stitches are not seen on the top at all. 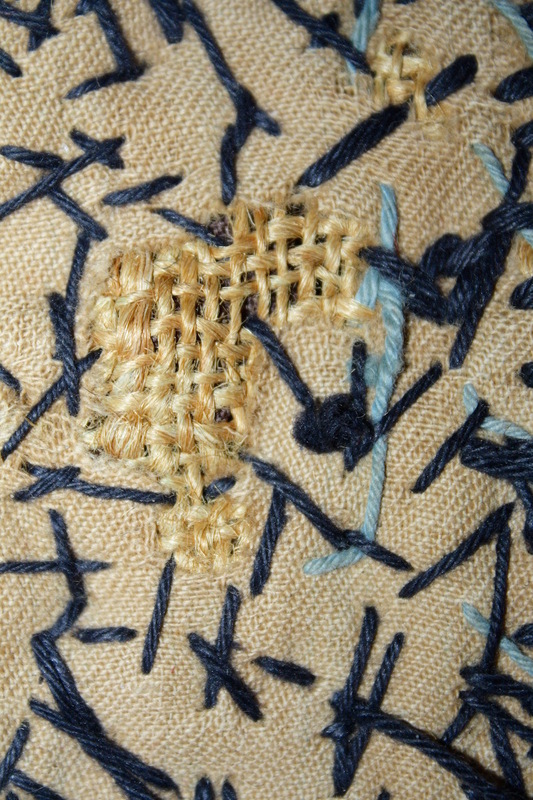 In one area the backing fabric has worn and we see a layer of burlap, with the same stitches covering it. Did the ladies make this repair? Did the owner? I do not think so since they have recently had some wear on the front professionally repaired by a West Virginia quilter (good work matching fabrics and threads). The steps I go through to mount this rug so its life can continue on the wall will be documented in the next few posts. In the mean time, to catch up with who Otha and Blanche McDonald were and the textile work they created, I invite you to visit the series of pages under the tab at ArtWools.com/McDonalds . Research has been supported by funding through a Tamarack Foundation Fellowship award. Glenville State College research library and the archives at the State Museum in Charleston, WV have supplied me with much of the leads and photographs. 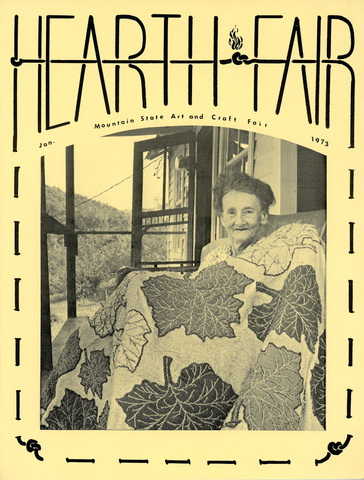 Blanche graces the cover of the first issue of Hearth and Fair which has become Goldenseal Magazine. Recently Emily Hilliard, West Virginia’s Folklorist, visited the studio and I shared my collected knowledge on the McDonalds along with my personal journey with textile crafts. 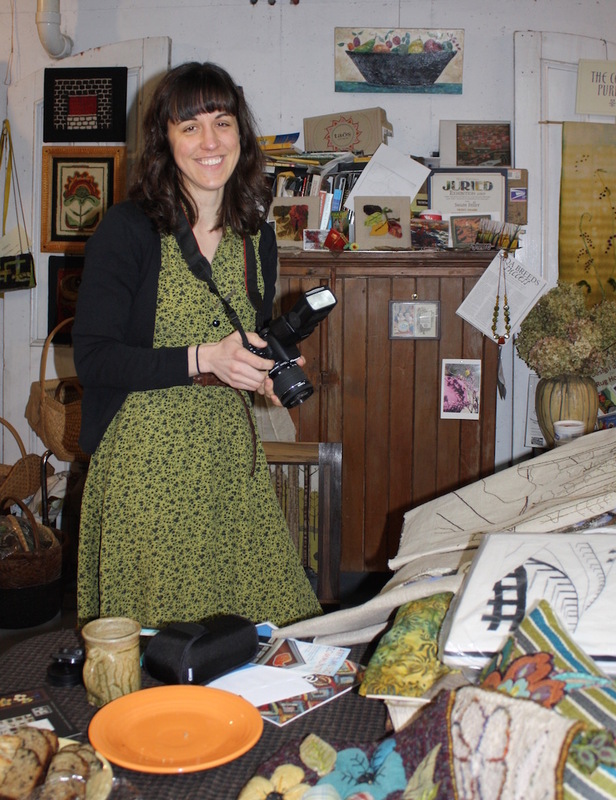 She is the first official folklorist for the state, funded in part through the National Endowment for the Arts and working at the West Virginia Humanities Council. The most recent pieces I have been working on channel the sisters and the revealing techniques they used. Measuring 11 x 14 each, the same design was first hooked to look like the back of a rug. The second piece is the front. 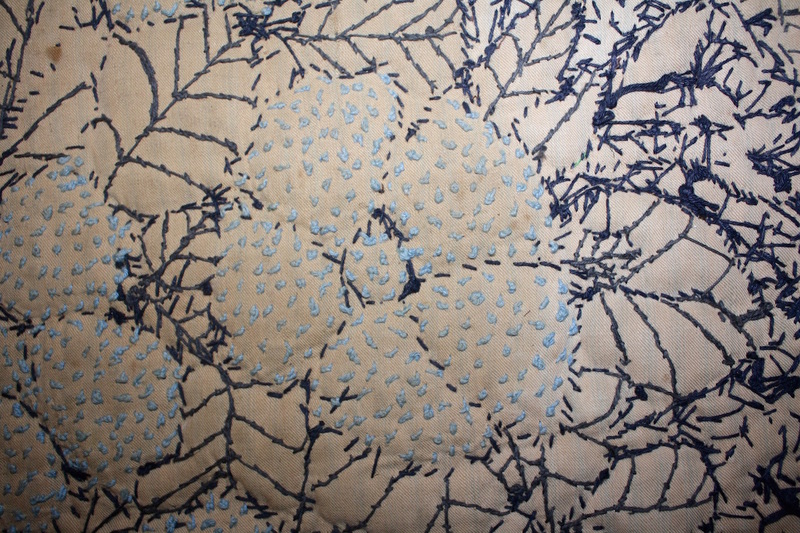 Each upholstery fabric petal is stuffed with polyester filling, stitched to the linen backing and then embellished with a different embroidery stitch to make each flower unique. I definitely felt the ladies were working alongside and perhaps Otha had some critical comments I brushed off as Blanche may have over the years together. The third version is a rearranged collage of upholstery fabric, applique’d and embroidered onto a striped sample. The back embroidered with a quote and book title by two environmentalists: Marjory Stoneman Douglas and Rachel Carson. This adds to the series “Pillow Talk” I have been creating over the past year. My studies throughout have been History and the Arts and this project feeds both of these curiosities. I continue to search for more work by Otha and Blanche McDonald. Perhaps you recognize their style and can lead me to a piece, please send a message. 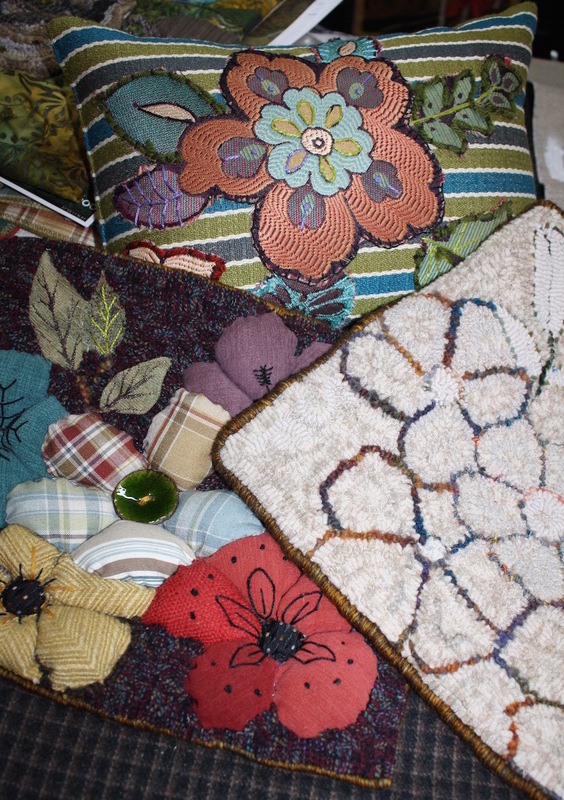 If you are interested in working on any of these handcrafts, I am teaching Rug Hooking, Applique’ and Embroidery at Augusta Heritage Center July 22-27 and would enjoy meeting you and sharing skills. 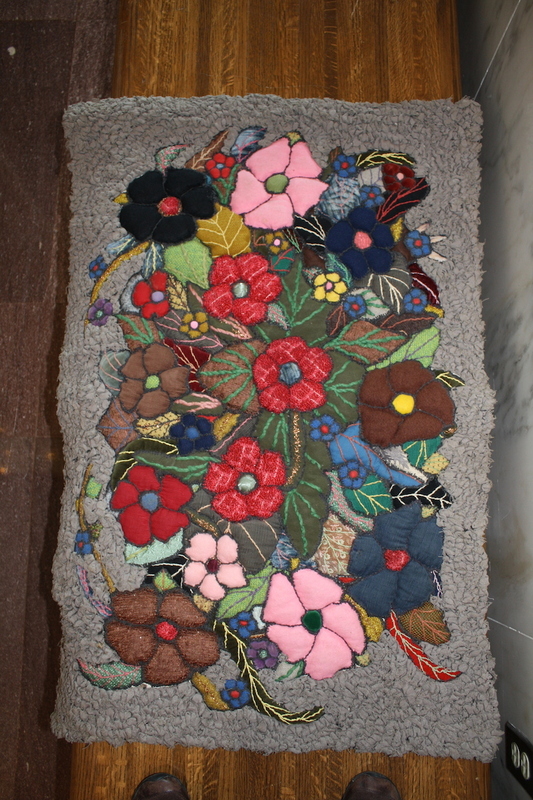 This entry was posted in elements and design in art, Fiber Musings, hooked rug workshop, McDonald Sisters, rug hooking workshop, textile art, Workshops and tagged Emily Hilliard, hooked rugs, National Endowment for the Arts, Susan L. Feller, Tamarack Foundation, west virginia, West Virginia Culture and History, WV Humanities Council on April 2, 2018 by Susan L. Feller. 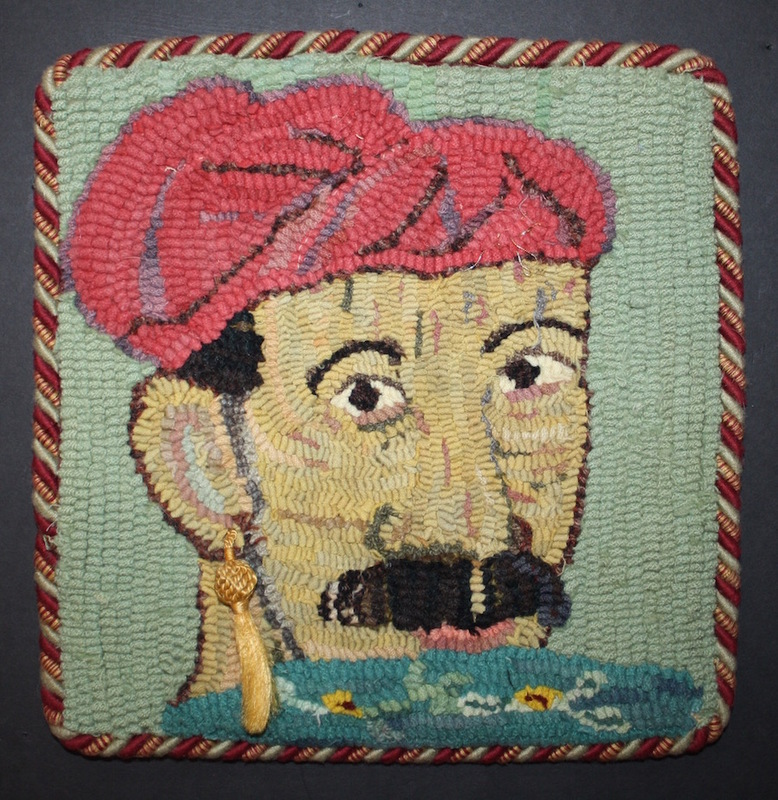 Another opportunity to combine traditions at the Schwenkfelder Library and Heritage Center, Pennsburg, PA has resulted in Face Time: Portraits in Hooked Rugs and Selections from the Heritage Center Collection. The exhibit is up through March 17, 2018. Susan Feller brought a variety of hooked work addressing the theme from self-portraits, friends, animals and a full group of church goers. Curator Candace Perry opened the archives and the two selected framed portraits of founders, animals, Halloween masks, frakturs, china phrenology heads and etched glasses all with faces. Come by to learn about traditions, history and leave with a smile on your FACE. An original design, Judy has studied and instructs how-to portray animals using rughooking. She is the author of Hooking Animals. Visit www.jcrugs.com. Mona was a good friend. Created to preserve our friendship, then she became ill. 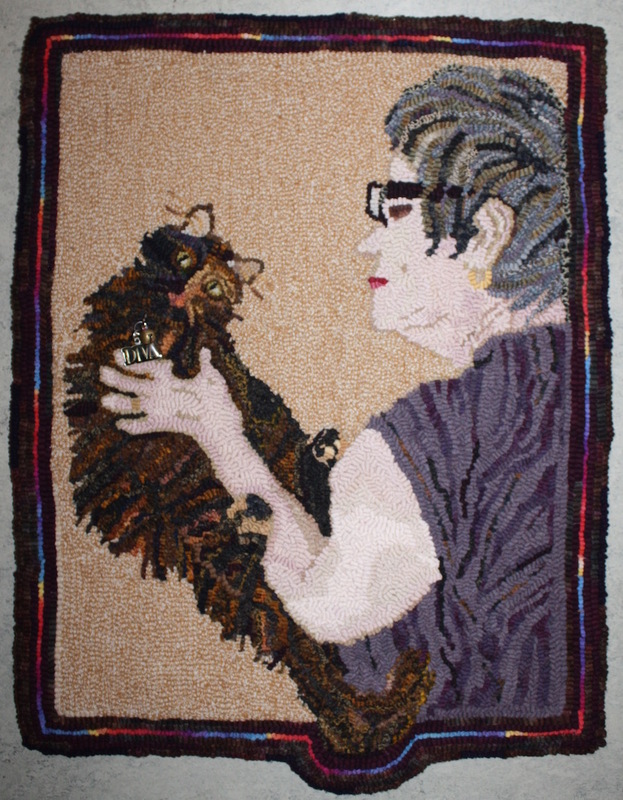 The rug was worked on during the months prior to her passing. 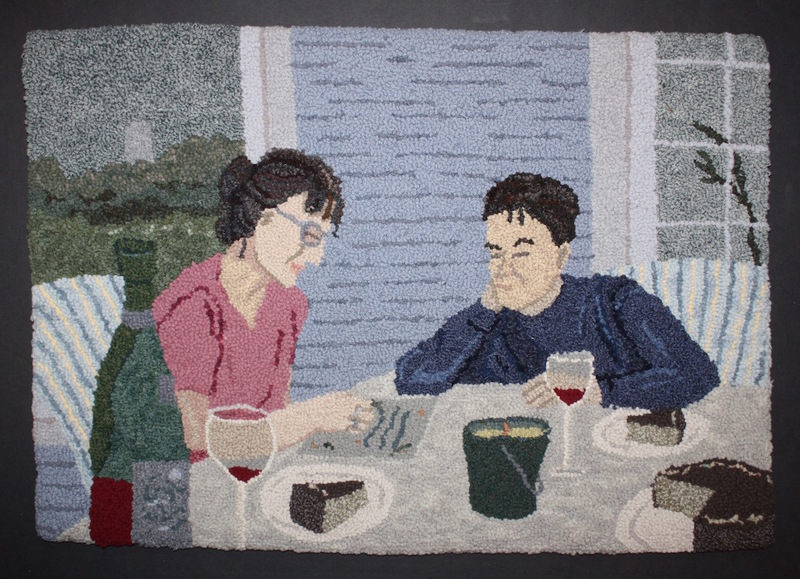 Rug hooking is good therapy and creates memories. Image is a serving man during the wedding of “the King of the World”. It was adapted from a Persian miniature of the Wedding Procession of Dara Shiloh. The congregation of Fairfield Presbyterian Church, near Richmond, VA 1940 Sarah’s family is in this gathering. She is the blonde girl in red jumper at her mother’s knee on the right. The original photo included about 200 people, with artistic license, 75 are depicted here. This entry was posted in elements and design in art, hooked rugs, textile art, West Virginia Artists and tagged fiber artists, frakturs, hooked rugs exhibit, Judy Carter, Liz Marino, Nola Heidbreder, Roslyn Logsdon, Schwenkfelder Library and Heritage Center, Susan L. Feller, west virginia on December 2, 2017 by Susan L. Feller.